This article was published in the June 2009 issue of the Data quest magazine . A Hindi version of the article can be read at the webzine Samayiki. Writers have always wanted their creations to reach a wider audience. The printed word has been a great medium and has inspired authors to publish their creation. From the ancient times of bhoj-patra to the sophisticated offset & laser printers and modern day digital e-books publishing has come a long way. Traditionally books have been published only through brick & mortar book publishing channels. Modern technology, however, has ushered-in a revolutionary new concept: that of Self publishing. The driving force behind self-publishing is a newer technology known as POD, short for “Print on demand”. The concept of POD itself is not new in the Digital World. Since 2003 a website Cafepress has enabled users to order customized Coffee mugs, Posters, T-shirts and so on. The fun part is: you can even use your designs and there is no minimum or maximum cap for order quantity. You can even order one Coffee Mug or a solitary T-shirt. Since about 3 years a new dimension got added to the POD scene, that of self-publishing, that enabled ordinary writers to publish their work. During 2006, when the popularity of photo sharing sites like Flickr was at its peak, websites such as Blurb came in with services that could convert your photo stream to a glossy coffee table book. Services like Lulu went a step ahead and started offering self-published books through the on-demand-publishing. And the step paid off. Last year alone, 98 thousand books were published by Lulu suing POD. Recently, the big daddy of online book selling, Amazon.com has also started its own self publishing service through CreateSpace. Desi companies have not been far behind in the game, but things are only getting warmed up here. 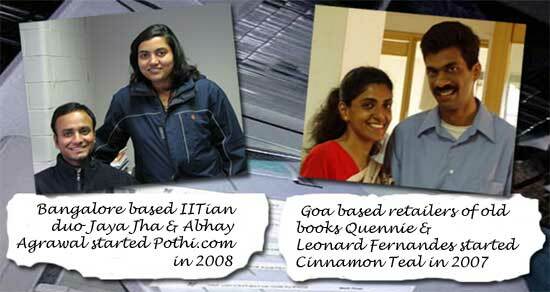 As of now, Cinnamon Teal, established in Aug 2007 by Goa based couple Quennie and Leonard Fernandes, and Pothi.com, established in July 2008 by the IITian duo Jaya Jha and Abhaya Agarwal, are leading the pack. There are some players like DepotIndia as well that impose some restrictions on the minimum number of copies that they can be ordered. Java Jha told us that the Print on Demand technology is being used extensively for corporate printing (variable data printing, short run brochure printing etc.) and for personal gift kind of segment (poster, mug, t-shirt printing) but in publishing it is still an early experimental phase. “The potential is certainly huge, but the stake-holders in the system have to come together and accept the changes in the workflow it demands, to be able to exploit this technology to the fullest. This includes everyone from the printers, publishers, authors, distributors and retailers.” she said. With the changing world our reading habits have been changing too. The concept of e-book doesn’t sound alien now and we read more online than we do otherwise. And with that people are now realizing the drawbacks of traditional publishing & marketing as well. 50% of the books in the United Kingdom are never read, figures must be similar for other nations. These unread books are converted back to pulp or dumped since most are not printed on recycled paper. The amount of carbon emissionsin printed these books that are never read is staggering, it’s like putting 1 lac cars on the road. Even if you don’t think of trees the environmental damage is not justified. Can the publishers & marketers be more sensible please and avoid giving those fancy unattainable projected sales figures.It feels good, thus, that e-books are slowly replacing the traditional ones. Digital books are cheaper, save paper and your computer and mobile phones can stores hundreds and thousands of them without occupying your drawing space. Then there are umpteen e-book readers like Amazon’s Kindle and the Sony e-Reader that also allow you to stay connected and read newspapers and blogs as well. For authors, this opens doors for a totally new breed of readers to tap. In traditional publishing books are printed in an estimated quantity and stored by the publishers, distributors and retailers. In POD, on the contrary, the digital copy of the publication is stored on a computer along with its design, layout and content and it’s printed and dispatched whenever the publication is ordered. Using POD it’s affordable to even print a single copy. The best part is, there are no inventory to manage and no headache of keeping track of unsold copies. If you are an author and wish to get published you will have to search a publisher first who would like to publish your work and if you are too lucky pay you a royalty as well. Not surprising that a lot of authors fund the publishers to publish their work. You obviously would find it hard to market such books, the best you could do is distribute the copies to your friends and reviewers. Self-publishing makes this task painless and you can achieve the similar results without spending a fortune. If you know how to use computers then you can even spend on the cost of typing & composing. Your work can be ordered anyone with an internet connection. Websites like Pothi.com help you track the sales and the royalty you earn. There are also discounts on bulk and self purchase. But doesn’t that make self-publishing Vanity publishing? Fernandes differs, “We have never asked authors to print 500 books and go market it themselves. We ask authors to print just 5 books (maybe even lesser) for private circulation or to have the books reviewed and then let the market determine the demand. We are still in talks with three distributors for sales in physical bookstores but presently we do list the books online on our bookstore and on Indiaplaza“. Jaya clarifies that POD is not for mass markets, “POD is meant for niche publications and that’s where it works the best. And, as is the case with any product, those who are able to market are able to sell. Passive authors are not able to sell.” she informs. And one could find proofs of POD slowly moving from the Vanity publication to the mainstream publication as well. Cambridge university press sold 10,000 titles recently using Lightening Source. Even big publishers now a days consider POD for printing old, out-of-print books. The newer publishers on the other hand prefer POD technology to evade the high costs associated with traditional printing, warehousing and unsold books. Who should go for self-publishing? If self-publishing is vanity publishing no more then what kind of authors go for it? “A lot of people coming to our websites have absolutely no idea about how to go about publishing their books. They recognize the value add POD (and our whole platform) brings to self. This leads to lower upfront investment, no headaches of inventory management, shipping, collecting payments etc. POD is also suitable for people looking for publishing books as memorabilia. Personalized books form very attractive and value for money gifts. Books of collections of writings are also popular.” Jaya said. Publicdomainreprints helps you publish old and out-of-print books. The non-profit website lets you search over 20 lac freely available titles from archive.org and Google book that you order using Print on demand facility. FaberFinds also lets you order classic titles. Bookmobile service is a van equipped with a satellite connection, laptop, laser printed and a book binding machine that keeps doing rounds in the schools in USA and makes available free titles from archive.org for as little as $1. The project was also brought in to India in 2003 and CDAC and Government of India had ambitious plans to increase the number of Bookmobiles to 50. However, there seems to be no buzz about the initiative now. The project website is also not operational anymore. Obviously, there are many other innovative uses of POD as well (See Box: POD Innovations). Fernandes narrated the case of a college in Pune that had a class size of 4 and an ever-changing syllabus. “So they chose POD for their textbooks so that they could print only 4 copies and change it the next year if need be.” he says, “then, there was one gentleman from Bangalore who published his grandfather’s poems for circulation within the family.” Both Jaya & Leonard mentioned that POD can be used to test the market and get feedback before hitting the market with bulk production. So the lesson: go for POD if the audience for the book is small or if you wish to test the waters before taking a plunge. When you are the publisher of your book the onus of marketing the work lies on your head too. Leonard suggests, “There is no point marketing a book in places where it’s not related to. For example, a souvenir for an alumni meet cannot possibly be sold outside the alumni circle. POD publishers should create awareness about the concept of POD and be imaginative about where this concept can be applied.” Jaya believes that the best place to market POD books is online. “The book should be an extension of author’s online presence through blogs, social networks and other social media outlets. He has to pique their curiosity so that they buy the book. It is important to communicate clearly as to what this new book will give them which they did not have earlier.” she said. Self publishing through Print on demand technology is an attractive option gaining ground amongst authors, not only in English but in Hindi and regional languages as well. It opens new doors for budding authors who are unable to find ready publishers as well for writers who only want to reach a close circle of readers. The advantages it offers over traditional publication are immense.